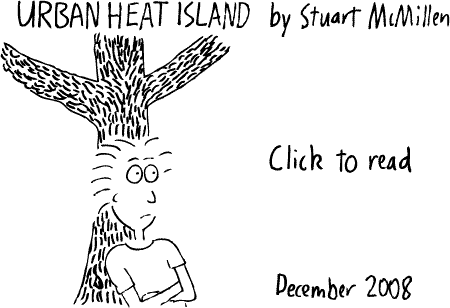 18 Comments on "Urban Heat Island"
That’s pretty awesome Stu! I really liked the drawing of the RE. Good to see you’re putting your talents to work again. Back on the pens again.Tried to make a copy for your collection folder but couldn’t do, perhaps it is longer than the others. Can you please contact me about permission to use your material in TravelSmart brochures/materials. nb the Royal Exchange hotel in Toowong, Brisbane (pictured in row 7) is currently changing its colour scheme from dark grey to a light creamy colour. …I doubt this cartoon is responsible for their decision! How do you propose to account for the tons of weight added by the soil, the water, and the plants. How do you propose to deal with the moisture and mold problems, as well as insect infestation. It’s NOT practical! As we have enough people in the world saying how things are bad it is great to see someone drawing out ways of making things better! Congrats! Well, nice idea, but not quite right. yes, white is a reflective color, but it doesn’t reflect all back into space, it can also reflect light onto other objects or the street, depending on its angle. Also, a dark color with the right building materials can be a nice trade-off, while it is only moderately warm during summer (depending on location, layout and materials used) it can help heat your home during winter. The easiest way to eliminate urban heat isles is to reduce cities, but this is very eco-unfriendly, because the used surface area would increase dramatically. Greening your city does help, but generates different problems and costs, which can be quite high compared with a supposed effect. Green roofs is a nice idea, if you have someone who cares about the plants, otherwise they can be pretty bad stuff for the materials used in building the house. All this greening of buildings will come with a price tag and since it is most effective with appartement buildings, it will most likely hit the poorer people of the country. Unlike mortar, plants grow and thus need a lot more care.. Question: In addition to insulating against heat, are green buildings also good insulators against the cold? The urban heat island is caused by all the heat exhausted from air conditioning systems into the air, instead of sending it into the earth as geothermal wells. Also the systems that cool the buildings themselves create heat which has to be radiated somewhere as well as they heat they’re trying to radiate. The hotter it get’s the more poorly designed air conditioning systems we purchase and install so the contractors have no incentive to rent a drilling rig to poke holes down below the gas lines. yes this is a wonderful reality.. please plant more trees in our home and environment.. GO GREEN…. Stuart…any chance we can get posters or prints of your work? I really appreciate your comics and their message, agreeing with almost all. There’s no irony or cynicism, which give them a calm, “buddah-like” power(although i love sarcastic comics). Whish more people would appreciate the work you do and what youre aiming at, so we’ll spread the word :)Keep on drawing, best of luck! Reflecting more heat into the atmosphere is not necessarily a good thing. This is perhaps especially true in urban areas where the air is full of greenhouse gasses. Green seems like it is definitely the way to go. Fiona – it’s not ‘heat’ that the white roofs are reflecting it’s solar energy (shortwave radiation), which is reflected back out to space *without* heating anything up. For short-wave radiation to be converted to heat, it needs to be absorbed, and, if you have a lighter colored roof, less short-wave energy is absorbed and radiated out again as ‘long-wave’ energy, a.k.a. ‘heat’. Also, greenhouse gases are well mixed in the atmosphere, so there is not a significantly higher proportion of them in cities where CO2 and other GHGs are emitted by human activity.